Since the new year started, I have been extra busy because I have started teaching regularly again. I hadn't realised it, but it has been a while since I baked anything else other than cakes! 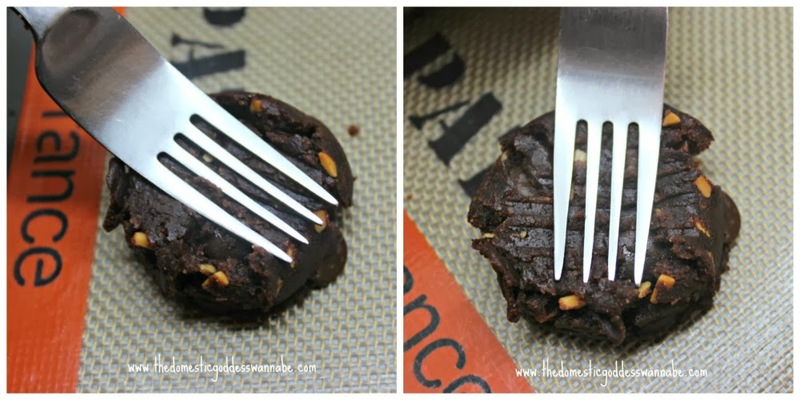 So today, I am sharing a recipe for a super duper easy peasy cookie. You don't even need a mixer to make these. I have been making these cookies for like, forever. Funny thing is, I had not thought about blogging about this until today, especially since this is so easy to put together. The best part is though, is that it tastes great - super chocolaty and crunchy with lots of peanuts! To make this cookie, all you need to do is to add sugar, peanut butter, cocoa powder and egg into a bowl. Then simply mix until everything was combined. I started off using a balloon whisk but the bits kept getting stuck in my whisk. It drove me crazy. Then I remembered I had a Danish dough whisk. Brilliant!!!! No more stuck bits! I added the chocolate chips and mixed. Using an ice cream scoop, I dished out balls of dough. If you do not have an ice cream scoop, use your hands and roll the dough into balls (roughly the size of a golf ball). These were placed on baking paper or Silpat baking mats. Then using a fork, I pressed down gently on the dough, and repeat from the opposite direction. The cookies were baked, then allowed to cool on the trays for 1-2 minutes before I transferred them onto a wire rack to cool completely. And you may want to bake more of these cookies. They disappear really quickly! 2. Stir together the peanut butter, sugar, cocoa powder and egg. 3. Add the chocolate chips and stir to combine. 5. Press down with the back of a fork and then press again from the opposite direction, to form the crisscross pattern on top. 6. Bake for 12 minutes and then let cool on the tray for 1-2 minutes before removing to a wire rack to finish cooling.